Neighbors worried about a couple who went missing 10 days ago as a fast-moving wildfire spread near the back-country property where the pair lived in the far southern reaches of San Diego County found two bodies Tuesday. The grim discovery in the 7,600-acre burn zone of the Border Fire near Potrero was reported shortly before 8:30 a.m., according to county officials. People who live near the Bell Valley-area home of the missing couple — identified as Jim Keefe and his girlfriend, Kyrie, whose last name is unknown — set out this morning to search for them, according to a Facebook page dedicated to the effort. Mourning friends speculated on the website that the two likely perished while trying to round up their dogs as the blaze spread. The charred bodies were found between two boulders on a hill off the 28000 block of state Route 94, roughly 50 yards from the nearest home. The county Medical Examiner’s Office will seek to positively identify the victims and confirm their causes of death. The sheriff’s department was first notified about the missing couple three days ago, according to the regional law enforcement agency. On Monday and Tuesday, deputies searched the vicinity where the pair lived and were planning to set out again when the bodies were discovered, sheriff’s officials said. Keefe, nicknamed “Barefoot Jim,” and his girlfriend were free-spirit artists who led rustic lives out of a van and a small trailer they parked on a parcel owned by an acquaintance, neighbors told reporters. The Border Fire erupted for unknown reasons on the morning of June 19 and went on to destroy five homes and about a dozen outbuildings over the next several days. 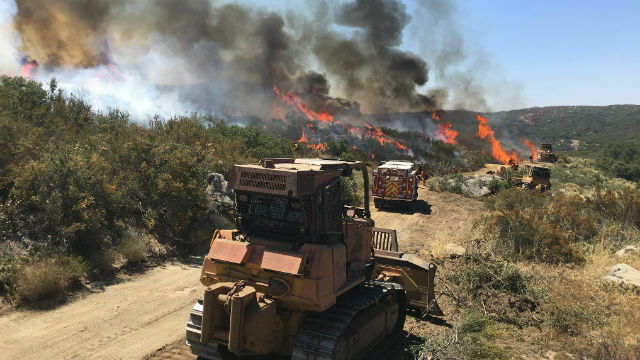 As of this evening, crews were still working to finish containing the smoldering footprint of the blaze, having gotten the burn area about 97 percent surrounded, according to Cal Fire.